Would you like to attract hummingbirds to your yard or garden? 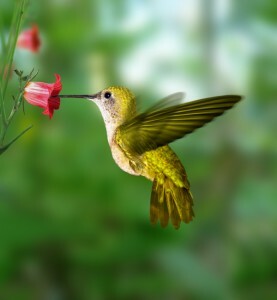 Hummingbirds are attracted to flowers, shrubs, vines and trees. Below is a list of flowers, shrubs, vines, and trees that hummingbirds are attracted to. Note: none of these need to be red in color, although the color red is attractive to hummingbirds. If in doubt as to whether any of the following will flourish in your area, please check with us! This entry was posted on Saturday, March 10th, 2012 at 2:47 pm	and is filed under Bird. You can follow any responses to this entry through the RSS 2.0 feed. Both comments and pings are currently closed.